Don Pedro’s stationary food truck and open-air patio on South 12th Avenue. 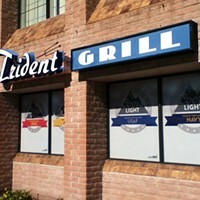 Friday-Saturday: 11 a.m. to 8 p.m. Sometimes in the face of adversity, events come full circle, evolving into an even better circumstance. When the original Don Pedro's restaurant on South Sixth Avenue closed down after being in business for five years, the family behind the sumptuous Peruvian food almost gave up. Turns out the fans and demand for Don's food was so great that the only logical move was to get the business back in, well, business. 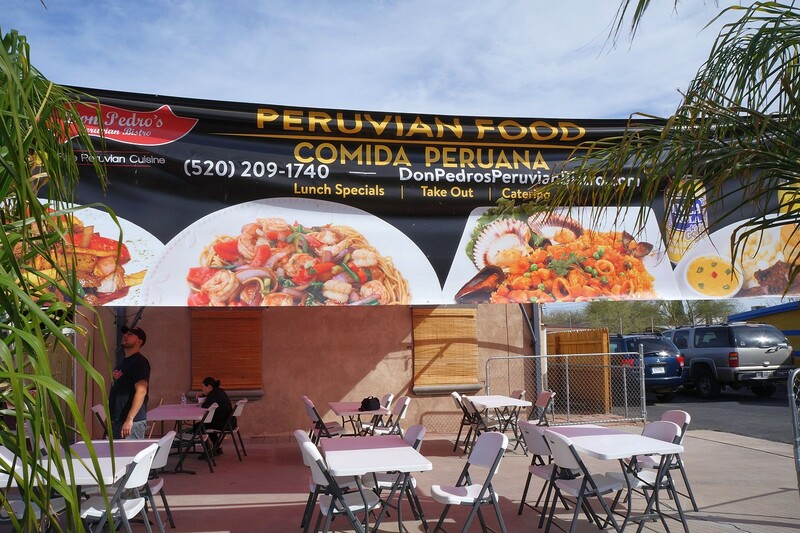 Since rent was the issue for the initial closure, the Don Pedro's team had to come up with an economical plan to get their nearly addicting street food inspired by Don's hometown of Lima, Peru, back to the good people of Tucson. So a food truck was the obvious choice. That way, Don and the family can scoot around the greater acres of Southern Arizona and introduce themselves to people that normally wouldn't get a chance to head to the south-Sixth side of town. It didn't take long for the flavors of coastal Peru to become a praxis of sorts to responsive eaters on all sides of the Sonoran Desert. The food truck was doing great, but when you are a dedicated restaurant owner, sometimes you just need an anchor and go-to junction instead of being a mobile unit cooking in dusty lots and far away parks. An opportunity on South 12th Avenue came their way and the Pedro tribe nabbed it. Thing is, it was just a plot of land without any structure on it, nothing resembling even close to a restaurant, so the idea to start small and build from there was planted. Working out of the original truck while still operating a second for events and catering, Don Pedro's is now an open-air patio concept that began operations in late February of this year. It might seem a bit odd and sometimes loud to be eating inspired fare just a sidewalk away from an oft-driven street, but in its essence, this is what the food is all about. Don Pedro, who came to the U.S. on a student visa in 1987 and obtained degrees in electrical engineering and accounting, has always had a deep love for the street food of his hometown and that love is easily appreciated in the taste and respect in his rustic dishes. Now, the prospect of gnawing down on beef hearts may induce queasiness in some, but his Anticuchos ($10) dish is outstanding. There is not a single hint of that coppery tinge when you eat offal; rather the seasoning, the rendering and the grilling give it a tender steak appeal. 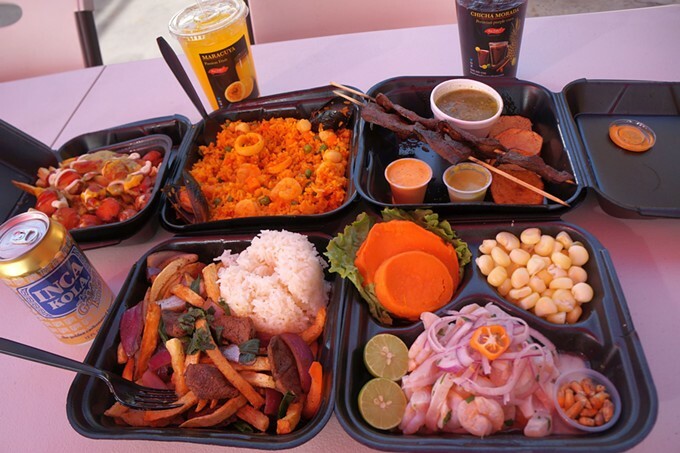 Served as a Peruvian kabob of sorts, you won't even know you are eating hearts by way of some kind of brilliant gastro guise because they are juicy, flavorful and strangely endearing. The most popular item is an obvious one because it is familiar on almost all fronts. Lomo Saltado ($12) is a provincial staple, with either chicken or beef, it comes rigged with a mélange of sautéed onions, tomatoes and scallions set beside a tumbler of crispy fries and a mound of steamed white rice. The carbs and protein are here so this can be an after-gym recovery or packing it in after a night of taking on the local pub. One dish Don had to include (speaking of trying to remedy a belly full of booze) is something called Salchipapas ($5 for a small, $10 for a big one), that has been a Peruvian post-party panacea for generations. You would think this dish originated in the depths of a trailer park, seeing as it involves a bunch of cut-up hot dog bits crammed over fries and then topped with either mustard, mayo or a green chile sauce called aji verde, which has a nice heat bite. For me, I did a little of each and the swirl made a nice marrying of both broke-kitchen culture and time-honored South American heritage.